Flat Bill or Bend? What is your style? While this river is running high I decided we had better settle this and let the sales do the talking. We have one "flat bill" style hat and one traditional trucker type hat. Whoever orders more wins the debate. What a great sales approach. We'll make dozens upon dozens of dollars! There is a lot of controversy over the "flat bill" hat and its entrance into the fly fishing arena. The history of the flat bill started with skateboarding then moved through motocross, bmx, snowboarding, baseball, most other sports and has eventually landed in fly fishing. Maybe all the same dudes that use to skateboard are now fly fishing since you've gotten old haha. What's the point of the flat bill? Add comments below please just keep it fairly clean. Based on my extensive research on the history of a flat bill hat here are the key points that have come up. Flat bill hats look new and sharp longer. Even when they are sweat stained and gross from rowing, from a distance it looks like you have a new hat. That is about all I have. Please enlighten me in the comments as to why you like or dislike the flat bill. Order a new hat. That one you have been wearing is an embarrassment. In fact, get one for looking good and taking the lady friend out to a nice dinner. One for fishing. Get the flat bill for looking sharp, get the traditional trucker for gettin' trout. $18.95 - Traditional Red's Trucker Hats with a slightly bent bill. You could flatten it more haha. That would be the opposite of what the old guys do. They love it bent. 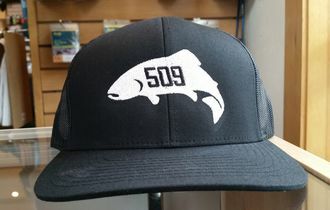 $19.95 - Flat Bill "509 Trout" Hats. This hat is super cool. Apparently you have to pay an extra $1 to get a flatter bill. I am a total closet redneck. Mike a trucker hat is appropriate attire for any occasion! And everybody likes the classic bent bill hats Joe not just the old guys! Traditional bend, but I'm an old man so I'm not down with the flatbill you know what I'm sayin'. The bend doesn't blow off so easy when the W kicks up. This is great Joe! I've been waiting for these 509 hats to go on sale. Order placed! While I like both styles, I have found that the flat bill lets me wear the hat lower with sunglasses to keep the sun out of my eyes and face on those blue bird days. My wife likes the orange, she says it's easy to pick me out of a crowd where all the men have beards and wear como. HaHa! Hats are all done flat or bent the new thing is visors and I noticed that there are very few options at your shop for a stylish visor let fix that issue before we invest money and time in yet a third hat option. Shan, we should have a design meeting to discuss the visor options for 2016. There are some vendors in Paris that are on the cutting edge of visor fashioned. From what I understand they make a hair piece with bleached and spiked hair that is actually included in the visor now. Bald guys will love it but it is assured to make anyone look like a tool so that nobody feels left out. Flat bill hats look good from a'far cause thats where they should stay. Far, far away from my head. I don't want a toilet seat for a hat. A perfect curved bill takes a bit of skill and a lifetime to perfect. Will someone please enlighten me on what Simms "509" is about? I LOVE Simms products, but have no clue on this... Thanks! Les, 509 is our area code out here and 509 trout is sorta Red's unofficial logo?